My experience at City Eyes has always been excellent. Charles and Jenna are professional, courteous and very knowledgeable and I know I am getting excellent value for money. The eye tests are very thorough and Charles always takes his time to explain fully each aspect of the examination. I have recently purchased a pair of glasses and Jenna was most helpful in assisting me with my selection and the final fitting. Ordering lenses and booking appointments couldn’t be easier. 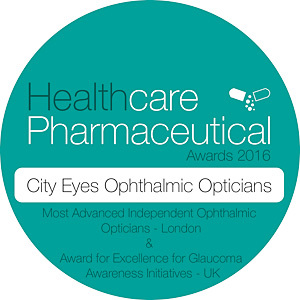 The level of service is very high and I am happy to be a patient at City Eyes. My friend has been raving about her examination. I was delighted to recommend her to you. Thank you for the very thorough eye test, indeed the most thorough I have ever had. I am very pleased with the excellent service I have received from you and will be certainly using you again in the future. Charles demonstrates an impressive depth of knowledge and experience in the area of eye care and health. Certainly, this was the most comprehensive and thorough eye examination that I have ever had. The level of service is superb, and the willingness to accommodate a busy schedule all combine to make it worth the trip to London for an appointment. I highly recommend Charles and his team. Thank you very much for the thorough check up and consultation. As I’ve neglected checking my eyes for many years or changing my glasses, it’s a great relief to know my eyes are in fairly good shape. Many thanks again and best regards. Marvellous exam from consummate gentleman.